Kenk: A Graphic Portrait is an utterly captivating, highly readable, and slightly unsettling comic book. Or is it a piece of graphic long-form journalism? Or perhaps a static, stylized arrangement of documentary footage? Even a kaleidoscopic collage of multimedia, peppered with interview transcription and narrative commentary? Kenk: A Graphic Portrait is a remarkable volume that is simultaneously all of these. It recounts the events leading to the arrest and conviction of “the world’s most prolific bicycle thief,” as Igor Kenk has been described by the New York Times and the Guardian. Mr. Kenk was notorious on the Toronto bicycling—and policing—scenes for years, even before his several well-publicized arrests and ultimate conviction in 2008. The police seizure of almost 3,000 bicycles and related paraphernalia—not to mention illegal drugs—made headlines were made around the globe that summer. Some of his notoriety was attributable to his neighborhood scavenging—scouring garage sales and sidewalk refuse for scrap he deemed worthy of reuse or, at least, retaining if not hoarding. He and his Bicycle Clinic were also well known—again, both to cyclists and police—as the go-to place for used bikes and bike parts. It seems to have been widely suspected that not all the owners of those “used” bikes had actually been finished with them when they entered Mr. Kenk’s possession. It seems few who knew the place had been under the impression that all this used stock arrived at Mr. Kenk’s door entirely through the choice of the original owners. The context and setting will be familiar to Torontonians, but the creative team presents enough reference information—text, maps, images, newspaper clippings—that the narrative will engage any reader, regardless of level of familiarity with Toronto or Mr. Kenk himself. Like The Next Day, released in the U.S. simultaneously with this volume, Kenk is anything but a traditional book, and Pop Sandbox is as much its producer as its publisher. The author, journalist Richard Poplak compellingly combines a selection of Igor Kenk’s own words with clever and pointed commentary to create a remarkable narrative. Artist Nick Marinkovich stunningly illustrated the book, working from initial image layouts prepared by filmmaker and designer Jason Gilmore. Finally, producer Alex Jansen conceived the project itself. He worked in 2007 with Mr. Gilmore to shoot the extensive documentary footage that underlies the greater part of the book’s content. 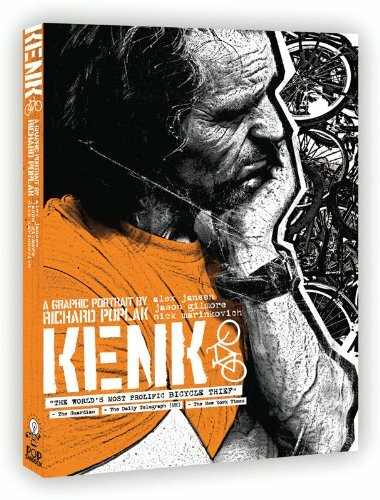 The unique feature of Kenk, then, is that the preponderance of the book’s content derives from background material gathered before the notorious criminal proceedings of 2008. We see images and read excerpts of interviews taken with Igor Kenk before he knows he will be convicted, in advance of his worldwide notoriety as a bicycle thief. One of this book’s many achievements is the mixed emotion it arouses in the reader. We know from the start that Igor Kenk is a man who was convicted of thousands of thefts—and not slightly romanticized Robin Hood thefts. Ordinary people lost items precious to them, but the monetary value of each stolen bike was low enough that the criminal justice system and an overburdened police division were of limited assistance to the frustrated victims. On the other hand, before he was arrested, we learn about this robber as a self-made immigrant with a solid understanding of economic concepts who decries the waste in North American society. Although he comes across as less than stable, he makes many valid points in his meetings with this book’s creators. Mr. Kenk’s arguments reflect environmental and wealth-distribution ideals that many reasonable people advocate. Indeed, there are moments where the reader will feel sympathy with a man who also makes us angry—whom we know will be found guilty of substantial property theft. This leads to an impression of near-betrayal when the reader approaches the end of the book and understands Kenk’s total disregard for the property rights of others. The impressive visual presentation and the tight, captivating narrative leave the reader with a sense of having gotten to know this man—even to understand him—while at the same time despising his crimes.